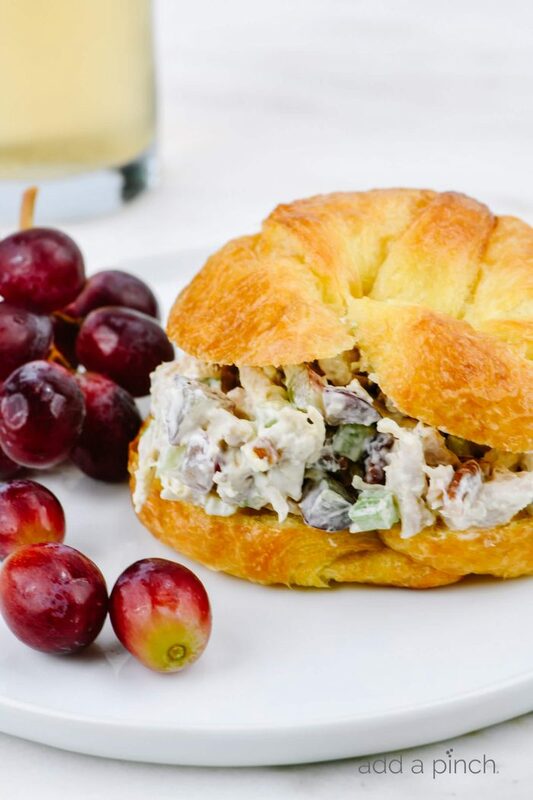 This Chicken Salad with Grapes Recipe makes a quick, delicious meal! 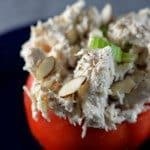 It also has roasted nuts for the best chicken salad recipe and makes a great chicken salad sandwich too! My husband loves chicken salad of all kinds. From the poppy seed chicken salad that makes a regular appearance to a grilled chicken salad, he loves them all. 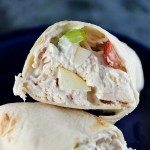 He especially enjoys this recipe, both as a meal and in the most delicious chicken salad sandwich recipe! One of his favorite versions involves fruit and tons of chicken. I’m always playing around with different versions with fruit for him. I think that you might like this recipe, too. 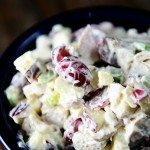 This makes a great salad for lunch, a light supper, and takes hardly any time to mix all together. I love to keep a container of it in the refrigerator for super quick lunches. It’s great on its own and makes the best sandwich and is delicious to fill wraps. I also love to make it to serve large gatherings of people at potlucks, picnics, or even tailgating! It is always a hit! I think everyone enjoys this recipe because of the addition of the fresh grapes. They add a burst of sweetness to the salad for the perfect blend of savory and sweet! Chicken. You’ll need four cups of cooked chicken that you shred or chop, depending on the texture that you prefer. For the chicken, you can use baked chicken that you cook ahead or even rotisserie chicken. Celery. Chopped celery adds the perfect amount of crunch and freshness. Grapes. Halved seedless grapes add a touch of sweetness. I love to use red seedless grapes as they add another bit of color to the salad. Dried Cranberries. Sweet and yet a little tart, the dried cranberries are a delicious addition as well. Roasted Pecans. Chopped roasted pecans are a great addition. Omit them if allergic to nuts or if you are serving at an event and do not know if there are nut allergies. Mayonnaise or Greek Yogurt. You can use all mayo or all Greek Yogurt in your salad or even a little bit of each. Greek Yogurt will help to lighten up the recipe, but it is definitely a matter of preference. Seasonings. Salt and pepper are the perfect seasonings for it. Celery leaves. Chopped celery leaves add so much flavor, but if you don’t have them just omit. How Long Does Chicken Salad Last in the Refrigerator? This recipe keeps well in the refrigerator for up to 3 days. Simply store in an airtight container. Wrap. Stuff and slice in half for a simple wrap. Croissant. Toast a croissant and then fill. Bibb Lettuce. Make a lettuce cups by washing and drying leaves of Bibb lettuce and placing onto a plate. Then fill with scoops and serve. If you are making for serving a large group, at a party or event, you’ll want to increase the amount that you make. Here is the rule of thumb that I use for how much to prepare per person. 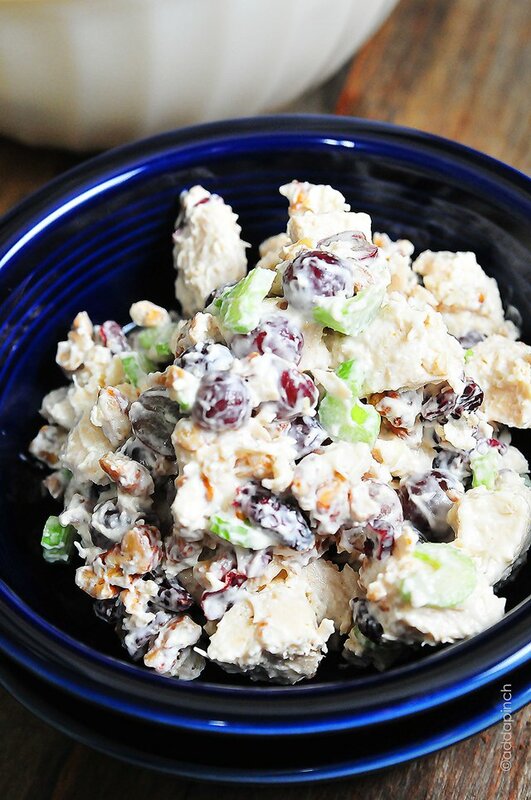 Here’s my recipe for Chicken Salad with Grapes that I think you’ll love. 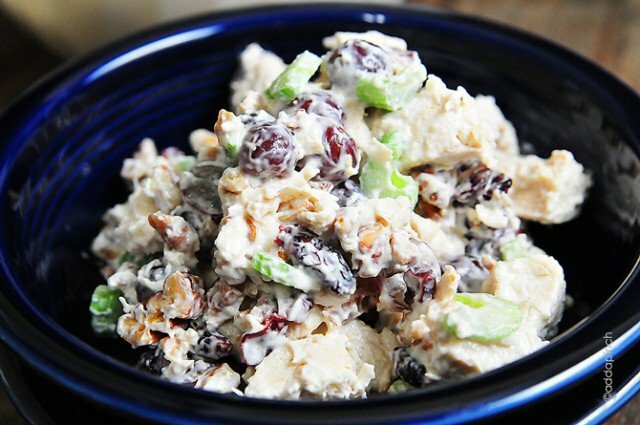 Chicken Salad with Grapes Recipe - This chicken salad recipe makes a delicious, quick meal. 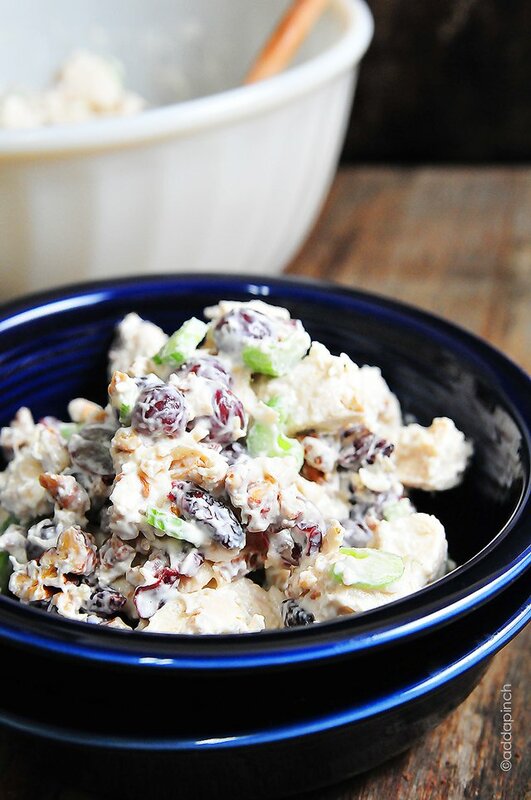 Made with chicken, grapes, and roasted nuts, it is always a favorite! 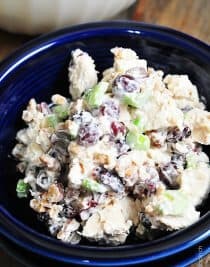 Add chopped chicken to a large bowl along with celery, grapes, dried cherries, chopped pecans, mayonnaise, salt and pepper. If using chopped celery leaves, add these as well. Stir together until just combined. To lighten up the recipe, you can use Greek yogurt in place of the mayonnaise. Very yummy. I used a store bought rotisserie chicken. My teens love this recipe and they’re very picky. Thank you for sharing your recipe! This was delicious. I made a couple of alterations. I used a rotisserie chicken, also, substuted pistacios for the pecans and I used 1/2 plain low fat Greek yogurt and 1/2 regular Mayo. Also, I would like to say that it does only take 5 minutes once everything is prepped. Pulling the chicken off the carcass and chopping it took longer than 5 minutes, not to mention, roasting and chopping the nuts, washing and chopping the celery, washing and halving the grapes and locating and measuring the dried cherries. In all, it took about an hour to come together. It is a nice make ahead dish and a good thing to keep in the fridge for when you get hungry. I served mine on a croissant with lettuce. And I had fresh tomatoes on the side. I’m so glad you enjoyed it, Pat. 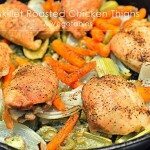 It is great to make with a rotisserie chicken! Thanks! Love the addition of the dried cherries! I am not much of a cook, BUT, I made this up with craisins I had instead of grapes and Cherries. Used the Pecans! And my husband LOVED it! Going to be a go to on a simple dinner night, or lunch! Absolutely delicious! Made it exactly as recipe says and I will not be deviating one bit. My sil said only thing wrong was I didn’t make enough! So getting ready to make another batch. Great to hear that you like it Joy! My husband always says the same thing! 😉 Thanks! My family enjoys it best with mayo, but it’s good with Greek yogurt too for those that don’t like mayo, or may want to lighten it up a bit. I hope you enjoy it – it’s one of our favorites! Thanks! When using rotisserie chicken, do you use the dark meat? In the past, I have only used chicken breast. Thanks. You can if you wish, Jenny. It’s a personal preference. Thanks! My bf ‘s comment and I quote “This is the best sandwich I have ever had. ” (I served it on croissants) Absolutely delicious!! It makes around 8 servings. Enjoy! I made it with a rotisserie chicken also. Had a pomegranate I needed to use up, so I used pomegranate seeds in place of dried cherries and also subbed 1/2 Greek yogurt for 1/2 of the Mayo. It tastes great! I’ve never made it with canned chicken but it would be probably be fine. If you try it, let me know how you like it.